We are excited to announce that Dolfans NYC has been approved by the Internal Revenue Service (IRS) to receive 501(c)(3) status. Our rapidly-growing fan club is now officially a non-profit, charitable organization. Under these new guidelines, we are able to continue raising funds for those less fortunate and hope to make an even bigger contribution in our local communities — both the New York metropolitan area and South Florida. We are very grateful for the continued support of the Miami Dolphins organization. It is thanks to them that we are able to ramp up our events and take our fundraising goals to the next level. In addition, we are extremely fortunate to have such generous and kind-hearted members of our club, without whom our fundraising efforts would be impossible. We would like to extend our heartfelt thanks to them for their contributions over the years to all of the causes we have supported, including the Miami Dolphins Foundation, the victims of the Metro-North crash, Hurricane Sandy relief efforts, The Concern Foundation and many more. In South Florida we have made an impact by donating annually to the Miami Dolphins Foundation, which provides support in South Florida communities under education, health and volunteerism initiatives. We have also made yearly donations to a number of riders participating in the Dolphins Cycling Challenge to raise money for the Sylvester Comprehensive Cancer Center. We are looking forward to hosting our first fundraiser as a non-profit organization during our watch party on September 10th at Slattery’s Midtown Pub as the Miami Dolphins take on the Tampa Bay Buccaneers week one of the 2017 NFL season. Two weeks later, on September 24th, we are anticipating a record-setting crowd at our annual #MetLifeTakeover. 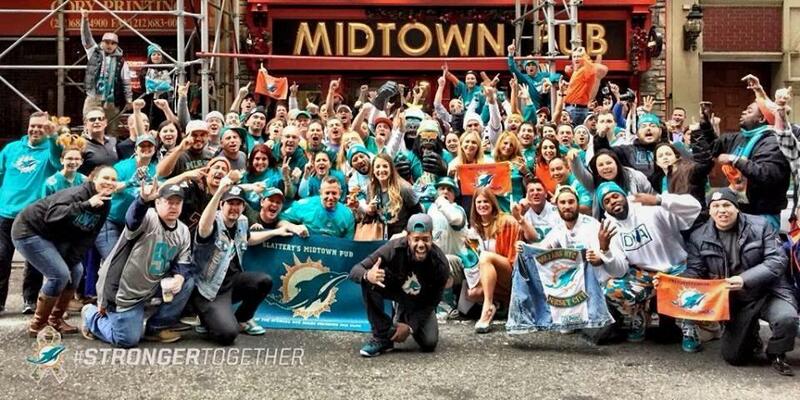 Since 2013 we have brought an average of 1000 Dolphins fans to the Dolphins at Jets game in New Jersey. Part of every ticket sale goes to our charitable efforts and combined with raffle and merchandise sales it is far and away our biggest fundraiser of the year. Going forward, Dolfans NYC aims to support the respective causes of past and present Miami Dolphins players, including the Cystic Fibrosis Foundation (Jarvis Landry), Multiple Endocrine Neoplasia (Jay Ajayi) and the Anthony Fasano Foundation to name a few. 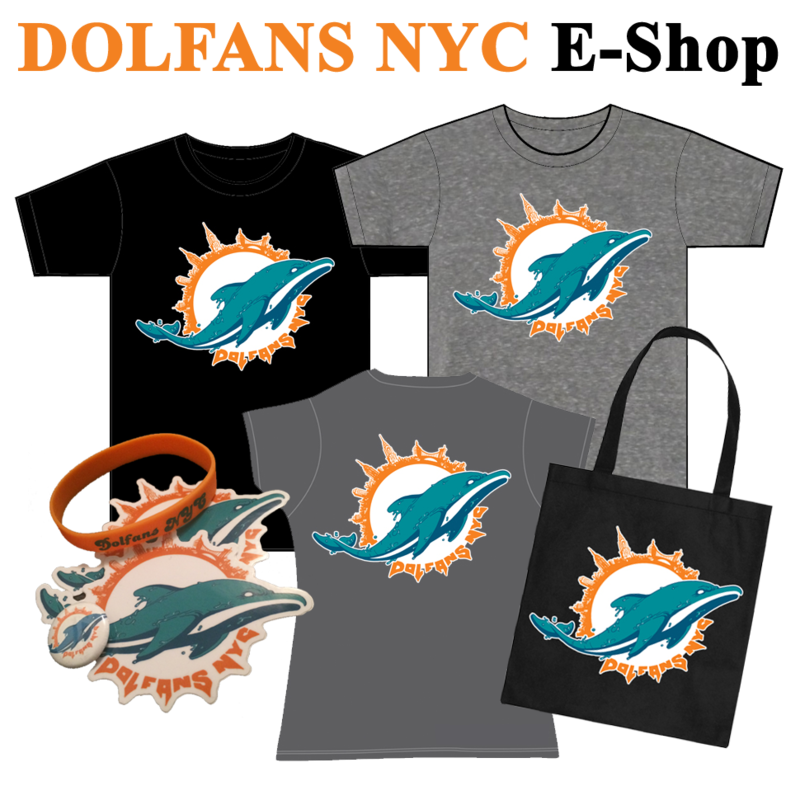 For any organizations affiliated with the Miami Dolphins or the NFL interested in partnering with us in our future fundraising efforts, please contact Michelle Kramers and Nate Igor Smith at DolfansNYC@gmail.com.